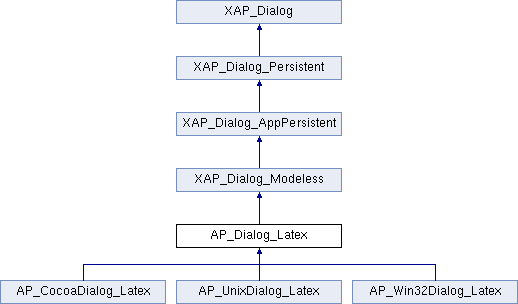 References XAP_Dialog_Modeless::BuildWindowName(), FREEP, gchar, XAP_App::getStringSet(), XAP_StringSet::getValue(), XAP_Dialog::m_pApp, m_sWindowName, and UT_XML_cloneNoAmpersands(). Referenced by AP_Win32Dialog_Latex::_onInitDialog(), AP_Win32Dialog_Latex::activate(), AP_UnixDialog_Latex::activate(), AP_UnixDialog_Latex::constructDialog(), AP_Win32Dialog_Latex::notifyActiveFrame(), and AP_UnixDialog_Latex::notifyActiveFrame(). References UT_UTF8String::appendBuf(), UT_UTF8String::clear(), GR_EmbedManager::convert(), XAP_Dialog_Modeless::getActiveFrame(), XAP_Frame::getCurrentView(), FL_DocLayout::getEmbedManager(), FV_View::getLayout(), GR_EmbedManager::isDefault(), m_compact, m_sLatex, m_sMathML, UT_UTF8String::size(), and UT_UTF8String::utf8_str(). Referenced by AP_Win32Dialog_Latex::event_Insert(), AP_UnixDialog_Latex::event_Insert(), and AP_CocoaDialog_Latex::event_Insert. Referenced by AP_Win32Dialog_Latex::setLatexInGUI(), AP_UnixDialog_Latex::setLatexInGUI(), and AP_CocoaDialog_Latex::setLatexInGUI. Implemented in AP_CocoaDialog_Latex, AP_UnixDialog_Latex, and AP_Win32Dialog_Latex. References FV_View::cmdInsertLatexMath(), XAP_Dialog_Modeless::getActiveFrame(), XAP_Frame::getCurrentView(), m_compact, m_sLatex, and m_sMathML. Referenced by fillLatex(), AP_Win32Dialog_Latex::getLatexFromGUI(), AP_UnixDialog_Latex::getLatexFromGUI(), and AP_CocoaDialog_Latex::getLatexFromGUI. Referenced by AP_Dialog_Latex(), AP_Win32Dialog_Latex::destroy(), AP_UnixDialog_Latex::destroy(), AP_CocoaDialog_Latex::destroy, AP_Win32Dialog_Latex::event_Close(), and getAnswer(). Referenced by AP_Dialog_Latex(), convertLatexToMathML(), AP_UnixDialog_Latex::getLatexFromGUI(), insertIntoDoc(), and AP_UnixDialog_Latex::setLatexInGUI(). Referenced by convertLatexToMathML(), and insertIntoDoc(). Referenced by AP_Win32Dialog_Latex::_onInitDialog(), AP_Win32Dialog_Latex::activate(), AP_UnixDialog_Latex::constructDialog(), ConstructWindowName(), AP_Win32Dialog_Latex::notifyActiveFrame(), and AP_UnixDialog_Latex::notifyActiveFrame().